Our company is the leading manufacturer, supplier, exporter and wholesaler of Concrete Mixer Machines which includes 200 Lit. Concrete Mixer, 100 Lit. Concrete Mixer, 10/7 H.F. 200 LIT. 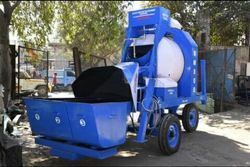 Concrete Mixer, Hand Feed Concrete Mixer, 7/5 H.F. (Hand Feed) 150 LIT. Concrete Mixer, 5/3.5 H.F. (Hand Feed) 100 LIT. Concrete Mixer, HF Concrete Mixer, Winch Tower Hoist, Concrete Mixer Machine and Half Bag Mixer Machine. These have awesome quality and excellent finishing. 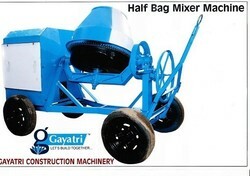 We are leading manufacturer & supplier of "Reversable Mixer Machine". Our company is the famous manufacturer, supplier, exporter and wholesaler of Half Bag Mixer Machine which are developed and designed by the adroit industry professionals and adhere to the industry laid quality parameters. Recognized through out the industry for its stellar performance, these mixer machines have several cutting edge attributes and striking characteristics which make it favorite among our clients. 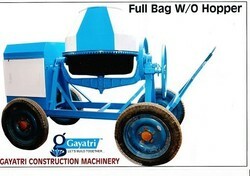 Our company has been highly acclaimed in the domain of manufacture, supply, export and wholesale of Half Bag Mixer Machine which are available in various technical specifications such as batching capacity of batching capacity of 100 liters and equipped with air or water cooled diesel engine.These bag mixer machines are ideally suited for level building sites and housing work in construction areas.In addition to this, these are manufactured at par with the set industry standards. 3 Ph or 1 Ph. 2 H.P. Electric Motor. Approx. Weight Of Basic Machine ln Kg. : 650 kg. Our company specializes in the manufacture, supply, export and wholesale of One Bag W/O Hopper Mixer Machine. These are highly used in mixing concrete in heavy construction. These give optimum performance and have long functional life. These are in huge demand among our national and international customers. Fabricated from top quality material, these are easy to move. Last but not the least these are available in different specifications and ranges. 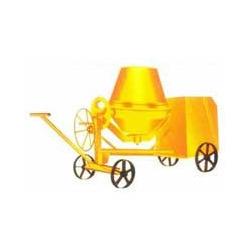 Our company is very well known in the domain of 10/7 ( One Bag )Mechanical Hopper Type Concrete Mixer which have high durability and give flawless performance. These concrete mixers are combined of several components which are pretested as per the industry laid parameters. In addition to this, these mixers undergo seamless finishing and are customized according to the needs of clients. Playing an important role in the construction of road, these are in huge demand among our clients. Our company deals in the manufacturing, supplying, exporting and wholesaling of 5/3.5 H.F. Half Bag Concrete Mixture. 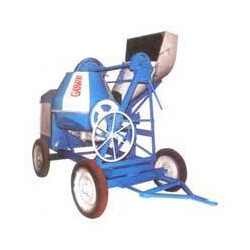 These concrete mixers are extensively used for construction purposes in the industry. Our clients can avail these concrete mixers in variety of dimensions and specifications. Pretested in industry laid parameters to ensure that these concrete mixers are able to give splendid performance for years, these mixers undergo seamless finishing. Powered By : 3 HP 1500 RPM / 3 Ph or 1 Ph. Electric Motor. Diesel : 5 HP 1500 RPIVI. Air cooled or Water cooled diesel engine. Approx. Weight Of Basic Machine ln Kg. : 350 kg. Our company has achieved accolades in the manufacturing, supplying, exporting and wholesaling of 3/4 Bag Concrete Mixer Machine (Hand Feed) which is available in myriad of ranges and specifications to suit the requirements of our clients. Equipped with drum and powered by water cooled diesel engine, these hand feed concrete mixers play pivotal role in the road construction and providing smoothness to it. Drum : Cast lron G.M. Bushes & Bearing Fitted Centrally & Balanced. Powered By : 5 H.P. Air Cooled / Water Cooled Diesel Engine Or Electric Motor	Approved By l.S.l. Approx. Weight Of Basic Machine ln Kg : 800 kg. Our company is the renowned manufacturer, supplier, exporter and wholesaler of As their name implies, these Concrete Mixer Machines are widely used for the purpose of mixing concrete machines and these have magnificent capacity to mix large amounts of concerts. Besides, these have rigid construction and are coated with anti resistant material which provides protection from corrosion and rust. Our company is among the most sought after companies which deals in the manufacturing, supplying, exporting and wholesaling of 5/3.5 H.F. (HAND FEED) 100 LlT CONCRETE MIXER. These concrete mixers are put through a comprehensive quality check in order to ensure that our clients get the best possible product. Having an outstanding capacity to mix tons of concerts together gives it an edge over several such mixers available in the industry. Approx. Weight Of Basic Machine ln Kg. : 160 kg. Our company specializes in the manufacture, supply, export and wholesale of Full Bag without Hopper. These are highly used in mixing concrete in heavy construction. These give optimum performance and have long functional life. These are in huge demand among our national and international customers. Fabricated from top quality material, these are easy to move. Last but not the least these are available in different specifications and ranges. Approx. Weight Of Basic Machine ln Kg. : 1000 kg. 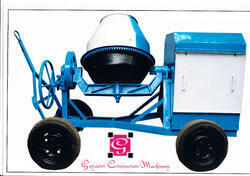 Looking for Concrete Mixer Machines ?